A CROWD of 682 had little festive cheer as Dumbarton lost 1-0 to Stevie Farrell's Stranraer at the C & G Systems Stadium. A CROWD of 682 had little festive cheer as Dumbarton lost 1-0 to Stevie Farrell's Stranraer in a poor match at the C & G Systems Stadium. Sons toiled in vain against Stranraer in what turned out to be new manager Jim Duffy's first home defeat. It looked for much of the game like they would grab a point, but a mid second half goal secured the points for the visitors. After a spell of early pressure from the Blues, wio were wearing black, Sons started to push back on the break. The first real chance of the game went to Dumbarton striker Dom Thomas on 18 minutes, only for his effort to go wide. On 36 minutes his curling cross to the back post was met by Calum Gallagher, but he fired over on the half volley, before a Bobby Barr strike was blocked by Stranraer goalie Max Currie. After the break Sons pressed hard, but without looking genuinely threatening in the final third. Stranraer broke the deadlock on 65 minutes, when Kyle Turner had acres of space to curl the ball home for 1-0 from the edge of the box. 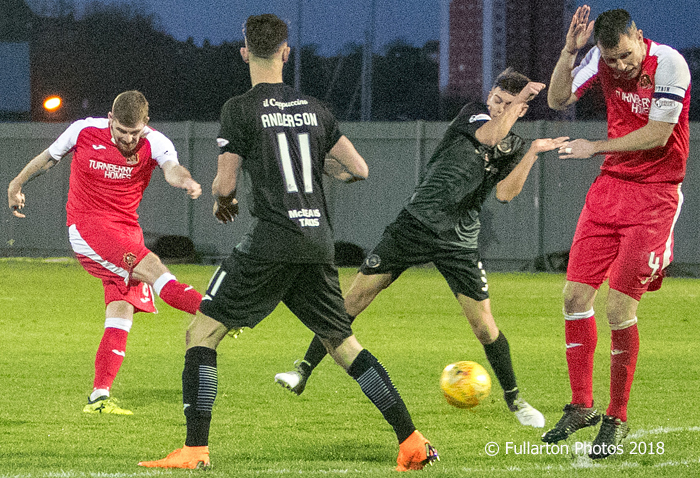 Dumbarton came straight back, leading to several frantic goalmouth scrambles, long range shots from Kyle Hutton, and near misses from Gallagher, Stuart Carswell and Bobby Barr. However, a late Christmas present was not to be.